At times we may require to set site collections to read-only to prevent any add/edit/delete operations on the site's content. During a SharePoint migration we decided to set sites to read only to restrict any updates. 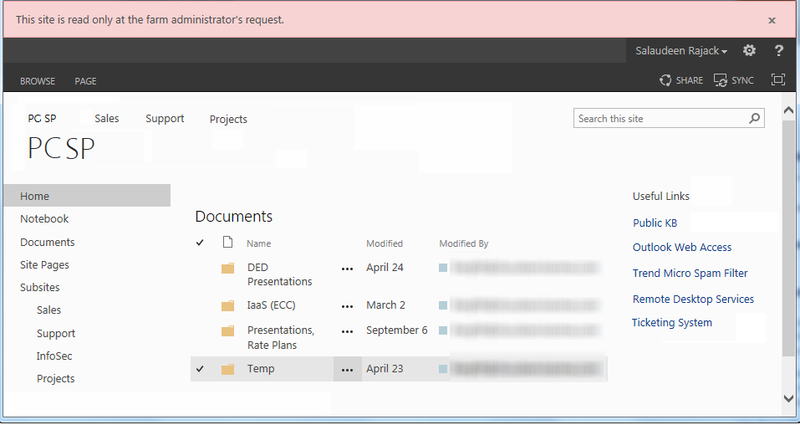 How to set site collection to read only in SharePoint 2013? Usually making SharePoint 2013 site collections to read only is done at SharePoint Central administration site. Choose the site collection you want to set on Read-only mode and select the option “Read-Only". Choose farm administrator controlled or site collection administrator controlled options accordingly. Enter the lock information and click "OK"
Fortunately, Unlike its previous versions, SharePoint 2013 displays a banner "This site is read only at the farm administrator's request" to notify end users - when site collections are in read-only mode! Once sites are in read-only, you may notice certain controls on ribbons, menus are disabled. But site content can be accessed as usual. Set-SPSite -Identity "Site-Collection-URL" -LockState "ReadOnly"
Set-SPSite -Identity $site.Url -LockState "ReadOnly"
To revert the Read only mode, Return to the SharePoint Central Administration's Site collection Quotas and Locks page and choose "Not locked". Set-SPSite -Identity "Site-Collection-URL" -LockState "Unlock"
Its also possible to make sites to read only using SharePoint Server Object Model: SPSite.ReadOnly = true. Setting up sites to read-only can be done at SQL Server also at content database level. Wow, I've used two of your scripts today! Thanks for posting. Adding your site to my SharePoint Favorites. How do we change the Read only banner at the top? I thought that the message in central admin when you lock the site would do the trick, but we still have the boring "This site is read only at the farm administrator's request." Edit Links Missing in SharePoint 2013 Navigation? How to Disable Sync button in SharePoint 2013?